Gandhi’s philosophy and his work inspired human right activist of his time and will continue to inspire generations to come. Long time ago when I was learning mathematics in elementary school, teacher told us that the numbers we use are called Arabic numerals. She told us Arabic numerals (1, 2, 3, etc.) were much more advanced that the Roman ones (I, II, III, etc.) and said the great invention of Arabic mathematicians was the number 0 (zero). Many years after finishing school, while on a trip to Middle East, I was looking at the poster glued on the wall of a building. It was in Arabic and since I don’t speak Arabic the only thing I could understand from it were the numbers. One thing didn’t make sense – while Arabic language is written from right to left, Arabic numbers are written from left to right. Why would Arabs write letters in one direction, and the numbers in the opposite direction? Since it obviously didn’t make sense I did a short Internet research and found out that so called Arabic numbers are actually Indian numbers or Hindu numerals. That famous 0 (zero) was not an invention of Arab mathematicians, but of Indian ones. Persians and Arabs were using the numbers their eastern neighbors – Indians -were using. And through trade and other contacts Arabs and Persians had with European merchants and travelers 1.500 years ago, those numbers came to Europe. As European merchants and travelers got those numerals from Arabs, they started to be called ‘Arab numerals’. Not only did we get numerals from India, but many mathematical discoveries as well. 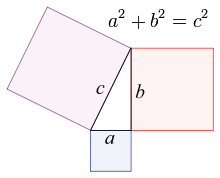 Famous Pythagorean theorem which you might still remember from your school years, which says that in any right triangle, the area of the square whose side is the hypotenuse (the side opposite the right angle) is equal to the sum of the areas of the squares whose sides are the two legs (the two sides that meet at a right angle), was explained in Indian Vedic scriptures long time before Greek mathematician Pythagora was born. The rope which is stretched along the length of the diagonal or a rectangle produces an area which the vertical and horizontal sides make together. 45 x 11 can be simply be calculated by writing down numbers 4 and 5 and inserting between them their sum: 4 (4+5) 5 or 495. 352 = 35 x 35 The last two digits will always be 25, and first two digits you will find by multiplying first digit with its next digit. In the case of 35 the first digit is 3 and you multiply its with next number which is number 4. To find square of 35 you write down 25 and add in front of it the result of 3×4. The result is 1225. 752 = 75 x 75 Two last digits are 25, first two digits are 7 x 8, The result is 5625. Here is video on which you can learn some more tricks. Hope you will like it.